I wanted to separate some of the project topics I'm working on. This being one. An upgraded high flow Cat design for the 06-09 Units. Wrapping up the design for the 5.0L shortly. Just need to get some stock units on hand to design from. These will be a Tig welded 304SS 200 Cell High-flow design. EPA Compliant emission standards. A cat delete option will be offered as well. I would recommend using a Cat simulator to prevent codes in that case. I've been running this design in 16ga on an 08 XKR For testing. I've had one efficiency light in 6 months. This was due to not letting the car warm up prior to driving off. For the final design I may up to 14ga wall to help contain more heat and heat the cat up faster. More than likely the finish will be ceramic coated to aid in preventing heat transfer outside of the cat as well as a nice appearance. Ceramic chrome is what I'm leaning towards. Although I have been talking with a supplier that may be able to blend Racing green. I'll be working on designs for the XKR and F-Types as well as mid-pipes next. Keep us posted on your progress. I look forward to hearing the final $$. Last edited by guy; 07-29-2015 at 03:50 PM. That's real purdy, too bad it's only seen by road-kill (but heard by all!). Haha! That's part of my dilemma with finish. My current prototype on the car now is finished in nice brushed stainless. I constantly put the car on the lift just so I can admire it. Maybe I should put mirrors in the floor of the garage. I'm working out quotes now for ceramic coating. Ball-park range 1400-1500$ is what I'm guessing. With the start up production of these I can do a batch quote if a few people are interested. Possibly do the 5.0L and 4.2L setups in same run and cut production cost a couple hundred depending on quantities. I'm going to wrap up the mid-pipes and try to get everything rolling at the same time. Have you been able to quantify the improvement yet. The earlier pulls I conducted were with a x-pipe and a 3" system since the test car is going to running a much larger twin-screw. I need to do back to back stock vs high-flow cat comparisons with 2.25" Piping. I'll see about testing on a stock unit asap. If someone is interested in trying this setup I can do a substantial discount. If local, even better as I can setup my DAQ unit to collect data. I'm a numbers and calculation based engineer. I don't shoot from the hip, I like to sharp-shoot. Now that I have a DAQ setup to monitor A/F, boost and other parameters I can test for accurate data. There will be a low end torque/ hp gain per what I'm seeing with my current test setup. In the 4000-4500 rpm region. Keep in mind, the system is limited by the manifolds diameter and collector design. Once one upgrades these the full benefit of the high-flow cat will be noticed. I live in Mooresville and have a 2007 xkr that's stock other than borla mufflers and x-pipe. lemme know if you may need it for any r&d. What is a DAQ system and can it be adapted to display that data on the touch screen? Shoot me your contact info. and we will discuss. Thanks a lot for your interest. The DAQ system is a data acquisition unit I have setup. Uses added sensors or exiting sensors to collect data. You can program the incoming signals for different sensors, such as A/F , temp, boost, timing, freq, voltage etc. Then display into a gauge. I'll setup an additional thread with some more info and how I set my unit up. My existing unit displays to software on my laptop for graphing, but I think based upon the HKS thread that you could potentially link a laptop screen using a GVIF to your display as well. Fixture Plates Cut for the Left and Right 4.2 Cats. I'll be welding everything up this week. I'll get quotes from a few vendors for coating and supply pricing. I'm going to coat these in ceramic for heat retention as well as a really nice finish. I'm thinking CT-23 Cool-Chrome finish as this withstands high heat and a nice build thickness 1-2 mil. This will help retain the heat inside the Cat, increasing the efficiency. The hotter the airflow, the more energy stays in the system which results in increased velocity profiles. I ordered Factory cats for the F-type, to start on a build for these as well. I'll have these done rather quick. Pricing will be quite reasonable on these as well. I'll post pics of the fixture later this week. There are several manufacturers of aftermarket cats. Any long tube header application (none for Jaguar that I know) uses aftermarket cats. Summit Racing and Jegs sell a variety. 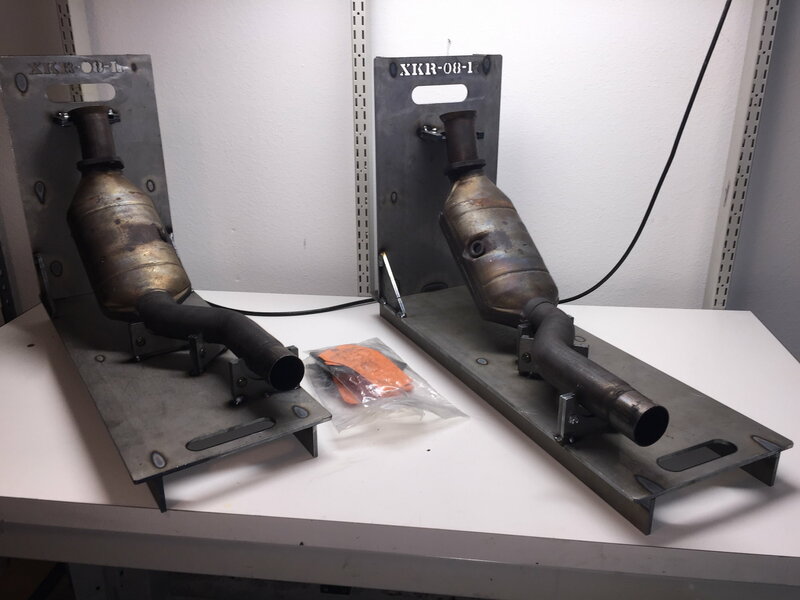 All 2007 JAGUAR XKR 8 Cylinder Catalytic Converters. 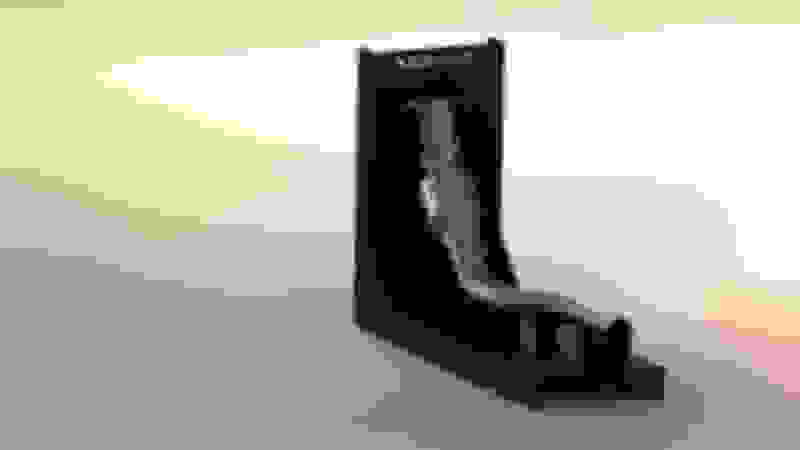 Catalytic Converters has a lot of information on cats, but little information on performance comparisons. Header providers such as American Racing Headers do supply cats with their header kits, and, presumably, these cats are likely to be "high-performance." Indeed, there are many providers for cats and highflow cat options. I typically use Stainless-headers and Burns-stainless product material as I know they are great quality and about the best you can find. David Vizard’s research shows that 2.2 cfm of flow at 20.4” of H2O will support 1 horsepower. I'm not sure of the stock flow numbers on the factory cats, but I'll test once I receive them. The cat's that will be provided with my Long tube setup will indeed be highflow, these will also incorporate v-bands for quick swaps for various options of cats, and straight delete systems for track. The setup fixtures I'm working on now are direct replacement, mandrel bend, with highflow quality 200 cell converters. Followed up with ceramic thermal coating. Due to design, the long tube options will use a different cat design as the collector is located where the current Cats are. Thanks, Derek. How about an X-pipe in a matching finish for the 4.2XKR? I'm now subscribed to this thread. Wonder if you have considered building headers also? I think it could be done - perhaps a tri-Y design might work best with very limited space available. Once contacted American Racing Headers to see if any interest in developing/producing Jaguar headers. No interest. Seems to me that that maybe just 1% of owners might buy headers if offered. Still that works out to 500 sets. I have read most of David Vizard's books, but am unable to find the new Vol. 3, How to Build Horsepower. Where did you obtain your copy please? MAF sensor was too small in diameter causing intake leaks. Mina is no longer marketing this intake system. Actually working on reverse scanning the mid pipe now and setting up a similar fixture. This will be an option shortly as well. Same process and material coating if you like. Yes it is a small market to design for. Plus the cost of developing a design is not cheap. The fixture , design process can be pricey on setting up proper headers. I want to see more options for these cars and if we are able to build them to be luxurious fast monsters, I'm going to help them along. I started the header project and should have a final set tested in coming weeks. For Vizards book, easiest place to pic them up is ebay currently. The fixtures will be welded up this weekend for the cats and I'll get some material in to build the replicated setup I have on the 08 XKR now. I'm waiting gather quotes for the ceramic coating now on the setup. I'm pretty sure I'll beat that price by 500$. Just depends on my price breaks on material and coating. The higher quantity I build at one time the cheaper I can price them at. If anyone is interested, let me know and I can price them out based upon fabbing a few at a time. I'll have a final set build shortly and coated. Cat Fixture near complete. Waiting on some material to be delivered and I'll tig together a set for coating. 5.0L and F-type Cat fixture next. I'll have plate cut for that this week. I have the F-type cats in , just need to measure them out.